With Dons in the thick of a promotion battle, there are plenty of candidates to win Player of the Year. Voting for the award opened this week, after last year’s cancellation following relegation. And this year it could be a close-run thing, with several candidates well worthy of the crown. Alex Gilbey returned to the first team this season after missing the final four months of last, and has barely missed a game. Not expected back until November time, the midfielder played every league game up until his injury against Yeovil two weeks ago. Relentless in the engine room, Gilbey has chipped in with three goals from the centre of the park, with his presence felt at both ends of the pitch. 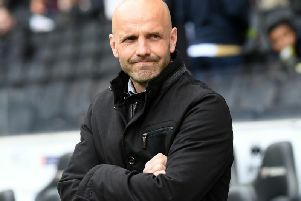 With as many as 14 new faces at Stadium MK this season, Paul Tisdale has breathed new life into Dons, and though he has not played much this year, summer signing Jordan Moore-Taylor was an early front runner for the prize with his bullish performances at centre back. Jordan Houghton too slotted into the lynchpin role which for so long was filled Darren Potter, winner of the award in 2012, and has impressed on a regular basis throughout the season. Further forward though, Dons’ goal-scoring exploits have been as strong as ever, with both Kieran Agard and Chuks Aneke in the richest goal-scoring form of their careers. Agard has found the net 21 times in 40 appearances this season, and despite rumours linking him with a move away from Stadium MK throughout last summer, Aneke - last season’s top scorer - has 18 to his name from 36 showings.